Reviewing my archive of images from last year’s sojourn in Italy offers a feast of wonderful memories. This makes it a challenge to select just one image to feature each day for the next two weeks. There are just so many!!! Today I’ve elected to share this photo, captured one evening during a walk into the heart of Firenze from our hotel. A small, flat-bottomed pleasure boat was being gently guided by a single oarsman through the shallow waters of the River Arno. A rare sight, indeed. 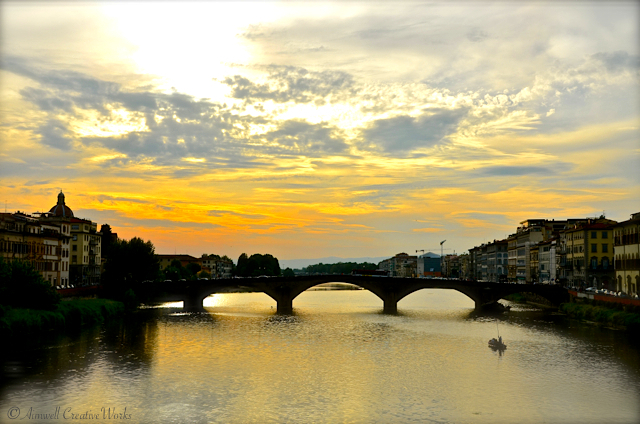 This entry was posted in Italy, Photography, Travel and tagged Aimwell CreativeWorks, boat, Dorothy Chiotti, Firenze, Italy, Photography, River Arno, sunset, Travel. Bookmark the permalink.